It was one of those connections I could not have orchestrated. So many women attended the meeting where I was speaking, but suddenly I was standing alone with one woman. Lori seemed surprised not only at the unusual circumstance but also at her openness as she began to tell me her story of having an abortion when she was in college. Later she wrote me that having an older woman listen to and pray for her gave her the courage to share her story with one of the women in her church. This woman accepted and loved Lori, and eventually, Lori became involved in the women’s ministry and even shared her testimony at their Bible study. Being welcomed by other women freed Lori to establish meaningful relationships with them and to use her experience to minister to other postabortal women. That's the power of welcoming one another as Christ has welcomed us. How do we do it? How do we enfold women in a way that points them to Jesus? Scripture tells us of a woman named Dorcas who had a dramatic impact on her local church. How she did this is an intriguing illustration of encouragement, harmony, and one-voice unity that glorifies God. Now there was in Joppa a disciple named Tabitha, which, translated, means Dorcas. She was full of good works and acts of charity. In those days she became ill and died, and when they had washed her, they laid her in an upper room. Since Lydda was near Joppa, the disciples, hearing that Peter was there, sent two men to him, urging him, “Please come to us without delay.” So Peter rose and went with them. And when he arrived, they took him to the upper room. All the widows stood beside him weeping and showing tunics and other garments that Dorcas made while she was with them. But Peter put them all outside, and knelt down and prayed; and turning to the body he said, “Tabitha, arise.” And she opened her eyes, and when she saw Peter she sat up. And he gave her his hand and raised her up. Then, calling the saints and widows, he presented her alive. And it became known throughout all Joppa, and many believed in the Lord (Acts 9:36–42). Why did the death of Dorcas cause the church leaders to send two men to Lydda to urge Peter to "Come to us without delay"? Surely other people in the church had died. What was it about Dorcas that created this crisis? She was not a high-profile leader. Her ministry did not make the headlines. There was no spotlight on Dorcas. There is an element of speculation here, but we do know that first and foremost, Dorcas was a disciple of Jesus. She was an ordinary woman who loved and cared for those around her as an overflow of God's grace in her. She welcomed others into her life because Jesus had welcomed her into His life. Whenever anyone reflects the love and mercy of Jesus, it is extraordinary. The death of Dorcas was designed by a sovereign God to demonstrate His love to the Church and to extend His kingdom throughout Joppa. He removed a person who was greatly loved and whose ministry touched the lives of people in that church and community, and then He gave her back to them as a gift from Him. A daughter of Dorcas enthusiastically welcomes a visitor in the congregation and invites her for tea. She listens to the woman, learns about her loneliness and insecurity, assesses her gifts and circumstances, and then gently asks if she would have time to help hem some garments. She's careful not to place demands on the woman but to communicate belief in her potential. The women pray together for the one who will receive the gift, and Dorcas invites the other woman to go with her to deliver it. Soon, Dorcas notices the woman sitting with a visitor and inviting her to lunch. Harmony and love quietly grow in the church family. Another daughter of Dorcas reaches out to some young mothers and asks if they and their children will go with her to visit the elderly. She helps the children make cards, suggesting Bible verses for them to write on the cards. Generational relationships develop and covenant community life is stronger. Another Dorcas-look-alike sends cards of encouragement and appreciation to the sick, to those going through difficult times, and to young people away in the military or at college. And those who may be vulnerable to drifting away from church are drawn closer. Another disciple of Dorcas greets first-time visitors to the church, learns something about them, and jots down their name. The following week, she greets them by name and introduces them to someone else so they begin to feel “at home.” They continue to return, and the church grows. I love seeing the daughter of Dorcas who takes a special interest in the pastor's wife and children. She frequently expresses appreciation for their willingness to share their husband/daddy with the congregation. She writes notes to the pastor and elders of the church, thanking them for their ministry. And then there are those daughters of Dorcas who spiritual mother younger women. As they meet together to study God’s Word and pray, there are times when a young woman expresses disappointment and frustration in her marriage. She feels lonely because her husband is not as attentive as she would like for him to be, or she doubts his spiritual maturity. Dorcas gently guides her to see that her lack of acceptance of her husband may be creating a barrier to his growth and development. They talk about how the young woman can be a life-giver to her husband. I can imagine Dorcas lovingly but firmly challenging the empty-nester woman who complains about boredom that there is kingdom work to be done, and offering to help her get involved in ministry. But when a young mother expresses frustration that she can’t be involved in ministry because she has young children, this same Dorcas encourages her to remember that there are different seasons of life and that her mission field is her home at this stage of life. 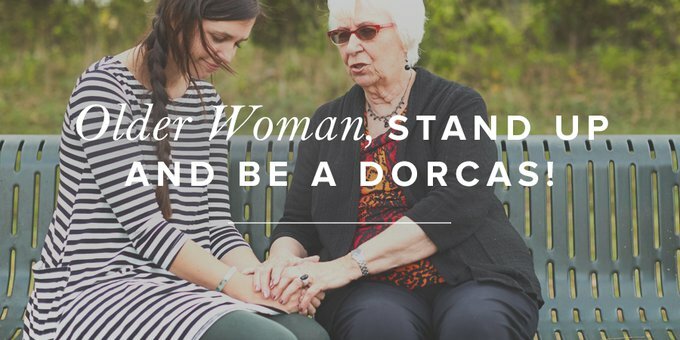 Women often hear the words, “I’ll pray about that” from Dorcas. And somehow they knew that she really will, perhaps because of the little notebook she immediately opens to scribble a reminder, or perhaps because she says, “Let’s pray right now”—and they do. People feel loved when they are with Dorcas, even teenagers with their crazy hairstyles and outlandish clothes. Somehow, it doesn't seem to make any difference to Dorcas. Mothers of these teenagers were also comfortable around her because she talks about how wonderful it is that the church has so many young people rather than wondering what has happened to the younger generation. This is what I have seen in modern-day daughters of Dorcas in local churches throughout the country. I can spot a contemporary Dorcas even when I visit a church I have never attended. There are always people around her. Sometimes they are laughing—sometimes you see tears. She has a smile, a hug, and a kind word for everyone. Is it any wonder the death of a Dorcas creates a vacuum in a church? When we are united to Christ, we are united to His other adopted children. We share a common purpose and potential. We are called to live for God's glory by reflecting His glorious character in every situation and relationship. We cannot do this in our own strength, but God has given us His Spirit and His Word to empower us. Dorcas is a commentary on living for God’s glory in the ordinary circumstances of life. She had a unifying effect in her church. You will too when you stand up and take your place among the daughters of Dorcas who, with one voice and heart, glorify the God and Father of our Lord Jesus Christ. Adapted from Susan’s book, Spiritual Mothering: The Titus 2 Model for Women Mentoring Women, published by Crossway.